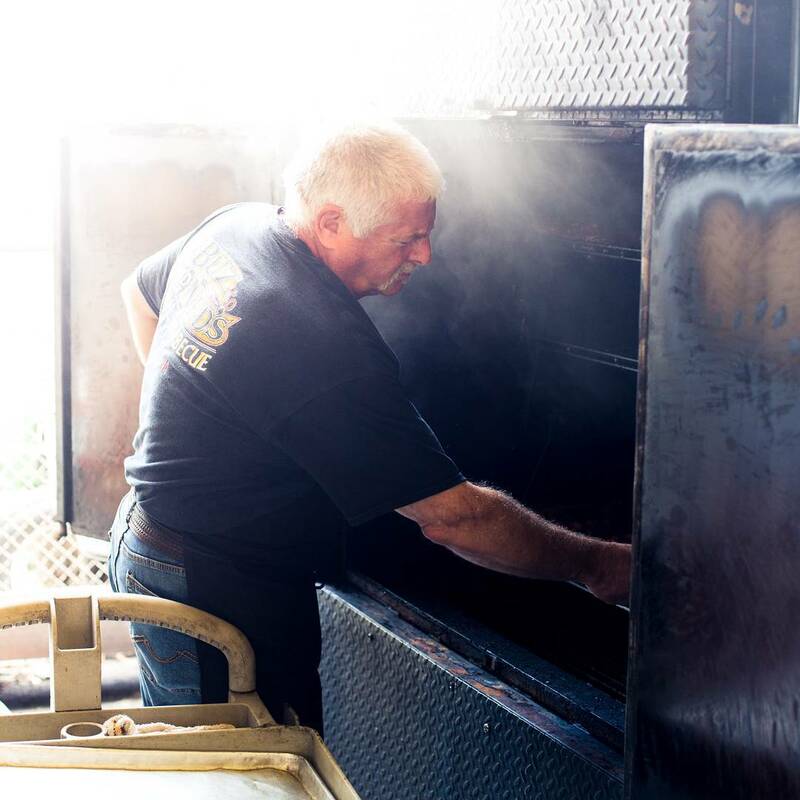 As they say in the barbecue world: “Where there’s smoke, there’s BBQ.” For well over a century, this was the prevailing thought for pitmasters everywhere, regardless of the style being prepared. Even open-pit style barbecue (which is classified as a “direct heat” or “marginally inderect heat” method) relies on smoke to impart those delicious flavors. But, in the last decade(ish) a number of new products have been made that have caused some voices in the barbecue world to would argue that smoke is less important now. Understandably, this has caused a lot of vocal debate over which method is the best. To better understand the debate, the first thing to explore the science behind each method. BBQ has many “origin” stories, but with few exceptions, they tell a tale of people who were (usually) paid in meat in exchange for work. At the time (as the stories go), the cuts given to these workers were considered substandard because they were often tough, fatty, or filled with tallow and sinew that made them undesireable. The most famous of which is probably Brisket. In order to make them edible, early chefs cooked the meat slowly, over time. This “low and slow” method breaks down the tough parts, melts (aka: “renders”) the fat, and helps to preserve the meat, so it stayed edible, longer. Initially, the smoke was simply a by-product of banking the coals in the cook-fire, in order to maintain a slower cooking process. A process that helps prevent burning, adds an amazing flavor that you simply can’t get anywhere else, and results in tender, succulent meat. 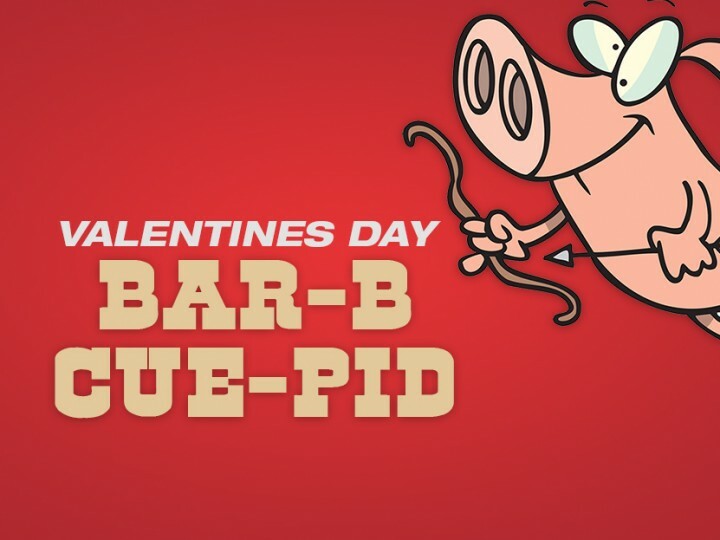 This flavor is why spare ribs and baby backs were added to the list of items most frequently found in a BBQ pit! As time went on, discoveries about the method were made that included the types of wood that were tasty (Hickory and Mesquite, for example), how to select the right wood, ensuring the wood is cut and cured (or not cured) to the pitmaster’s specifications, and monitoring the temperature constantly. This ensures you’re cooking with the right type of smoke, and that the food isn’t cooking too fast. The downside, to the traditional method, is that it takes a lot of time, patience, and experience. If the temperature isn’t consistent, you get a meal that is flavorless, if the heat is too high, you’re left with dry, tough ribs. If the temperature is too low, you’ll be cooking until your grandchildren are hungry! As society advances, we’re moving farther away from cooking for ourselves, and more towards pre-packaged, prepared foods. Time is of the essence, and everyone seems to be short on it, despite advances that make almost everything faster and more efficient. Many pitmasters will recommend cooking a brisket for 30-45 minutes per pound (depending on the temperature). For a restaurant to BBQ a 15lb brisket, that means they have to monitor it for 8-14 hours! Considering the cooked weight can drop by as much as 50%, you can see how much time is spent to cook for just a few people! The “BBQ arms race” (as some have called it) really gained in popularity when a few savvy BBQ restaraunts decided to cut costs and time by using gas instead of wood. 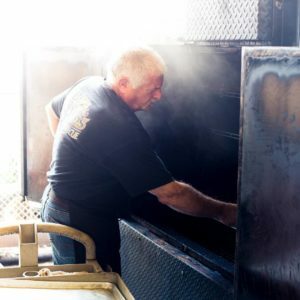 While liquid smoke can be great at adding smoke flavor, purists argue that it doesn’t capture the real smoke flavor of a real BBQ pit, and worse, it’s generally employed by places that cook at a much higher temperature. The downside to these methods are that the flavor doesn’t penetrate as deeply into the meat, and the flavor of gas is notable. As most folks already know, the flavor of BBQ cooked over gas has a distinctive flavor that nearly everyone can recognize, since the gas used for cooking contains a scent additive, most people can taste. Unfortunately for BBQ purists, these methods are employed by so many places that cooking with wood has become the exception. 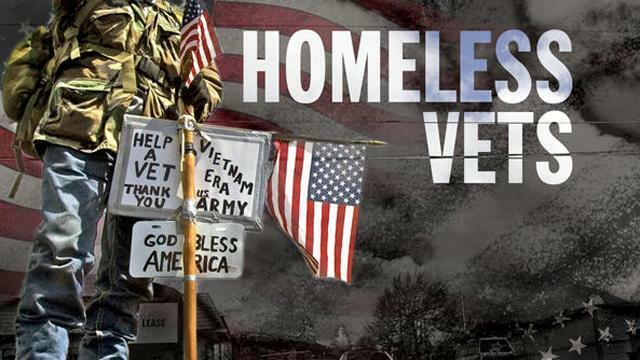 Adding our voice to the debate, we couldn’t agree more. 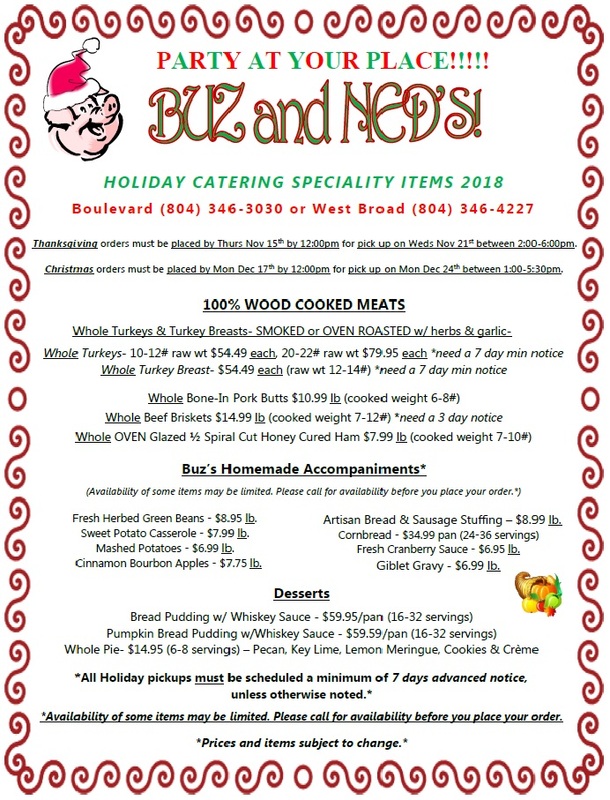 This is why Buz and Ned’s has offered 100% wood-cooked BBQ since we opened in 1992. 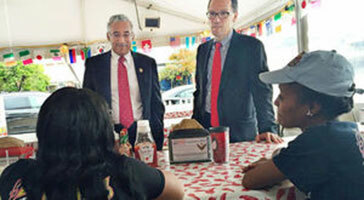 By refusing to cut corners in order to boost profits, we have been able to serve BBQ to the Richmond community we can be proud of. Each time we hear our barbecue referred to as “Virginia Style”, or see the “saucy smile” on a little-one’s face, we know we’ve made the right choice! 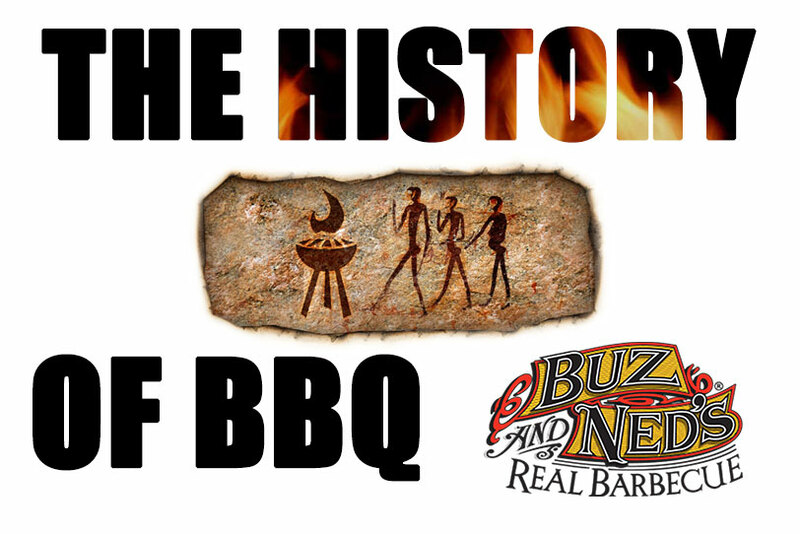 In the last installment of our unofficial history of BBQ, we looked into the history of fire as it relates to cooking. Today, in part 2, we’ take a look at the importance of smoke. Tune in to our next installment where we will explore the various styles of BBQ, by region!